I've been a little busy knitting lately, that would explain why I haven't been scrapbooking. 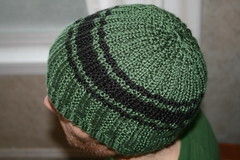 I made a manly green striped hat. I found the pattern on line and the decreases drove me crazy. If you use the pattern just do it like it says but the established pattern is the new pattern and not the original one. Very confusing. Nice modeling, Sweetie. 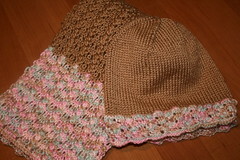 The next project I worked on was a hat and scarf set. The hat has a variegated lace on the edge, very nice. Here's the pattern if anyone wants to make it. I somehow changed the lace thinking I had to purl on the back of every row instead of knit. Oops. It looked great though. It didn't take long to make after I finally figured out what I was going to do. The scarf on the other hand....drove me nuts. I knew I wanted to have the lace on the edge like the hat but I couldn't find a good stitch to make the rest with. Everything I tried rolled into a tube. I don't know how many times I torn that thing out. I finally decided to just do the modified lace stitch for the entire scarf. It rolled some but after blocking it looks gorgeous. I hope my friend is staying warm with them. 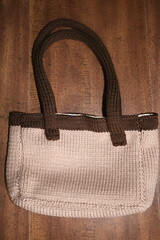 The other project I've been working on is a small tote bag to take to church. 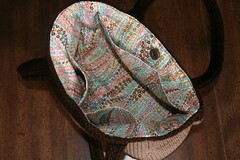 (I've made myself a purse like Janel's only brown with a turquoise paisley lining, very cute. I haven't gotten a picture of that yet because I filled it right away and it's not been empty yet. Some day I'll get a picture.) The tote turned out to be a great size. I did measure it out before hand but sometimes things happen and they don't end up like you think they will. (By the way it's my own pattern and I didn't write it down, maybe next time.) Anyway, after searching the entire fabric store for lining fabric and coming up empty handed I thought I'd look one more time. I found this great fabric right away. Why did it have to hide the first time I looked? I waste enough time by myself. I of course had to put pockets in it and a magnetic closer. It turned out great, in my opinion. I'm considering selling these bags on eBay or somewhere. I've also been working on some blocks to make Warm Up America afghans. We are making them in my church sewing group. I think we're up to four now. I also just bought some funky yarn to make myself another pair of socks. It's been so cold lately and my feet just won't stay warm unless I have on a pair of regular socks and a pair of my hand made socks. I never did get a picture of those did I? They don't look as nice as they did when I made them, but they're still warm. A lot of the fuzz has washed off. I'll be sure to get a picture of the new pair if I ever find time to finish them. kelly, your knitting skills truly amaze me! you have an eye for detail. I can see that you put effort to make these things perfectly! I am amazed. The hat you made for Mickey looks great, The hat and scarf are beautiful, and you know I love your totes and I will continue to encourage you to sell them. Perhaps a local consignment shop or gift store??? That might be more fun than ebay or etsy. Just a thought. Oooh or a craft fair! Seriously, you have many talents, and I think this is my favorite of yours! Seeing your stuff makes me want to re-try to knit again. Thanks, Becca. I think I enjoy knitting the most and maybe that shows in my work. If you ever want to relearn knitting just let me know, I'd be happy to help you get back into it. By the way, the hat isn't Mickey's. He wouldn't ever wear such a thing. He barely wears the socks I made for him. He was just the model for the picture. Just for the record, the hat and brown scarf and hat are AWESOME! I just wish Mark could be as great a head model as Mickey apparently was for that sweet green hat! That purse is super, super cute, too. Most excellent knitting award goes to Kelly S.!